Simply Southern Girl: Sweet like "Apple Pie"
Blend flour, sugar, and salt in processor. Add butter and shortening; cut in using on/off turns until mixture resembles coarse meal. Add 6 tablespoons ice water and blend just until moist clumps form, adding more ice water by teaspoonfuls if dough is dry. Gather dough into ball. Divide dough in half. Flatten each half into disk. Wrap in plastic and chill at least 3 hours. DO AHEAD: Can be made 1 day ahead. Keep chilled. Soften dough 15 minutes at room temperature before rolling out. Butter 9-inch-diameter glass pie dish. Roll out 1 dough disk on lightly floured work surface to 12- to 13-inch round. Transfer dough to prepared pie dish and press dough onto bottom and up sides of dish, allowing overhang to extend over sides. Roll out second dough disk between sheets of parchment paper or waxed paper to 12- to 13-inch round; transfer dough to baking sheet. Refrigerate both crusts while preparing filling. Position rack in center of oven and preheat to 425°F. Combine all apple wedges, 1/3 cup sugar, raisins, quick-cooking tapioca, grated lemon peel, 1/4 teaspoon salt, and nutmeg in large bowl; toss to blend. Let stand at room temperature until some juices form, tossing occasionally, about 15 minutes. 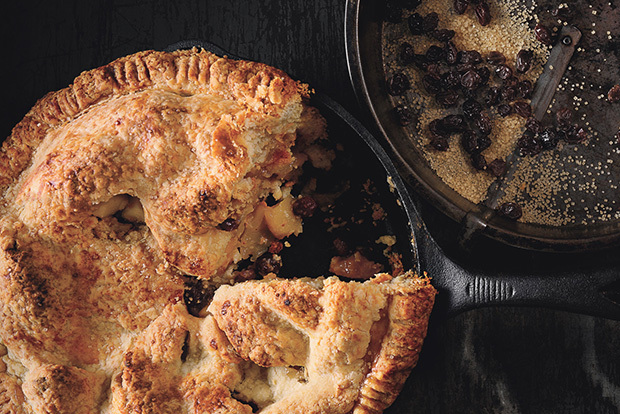 Place crust-lined pie dish on rimmed baking sheet. Sprinkle graham cracker crumbs over bottom of crust. Transfer apple filling to crust, mounding filling slightly in center. Dot filling with butter cubes. Brush crust edges lightly with water. Remove top parchment sheet from second dough round. Invert dough round atop filling; remove second parchment sheet. Trim dough overhang on both crusts to 1/2 inch. Press crust edges together, then fold under. Using tines of fork, press on crust edge around rim of dish to seal decoratively. Using small sharp knife, cut six 1-inch slits in top crust, then cut out 1/2-inch circle from center of top crust to allow steam to escape. Brush top crust lightly with milk, then sprinkle with raw sugar. Bake pie 15 minutes. Reduce oven temperature to 375°F and continue to bake pie until crust is golden, apples are tender when pierced, and juices are bubbling thickly through slits in crust, covering crust edges with foil collar if crust is browning too quickly, about 1 hour longer. Transfer pie to rack and cool to lukewarm or room temperature. Cut pie into wedges.